Most scientific glassware requires periodic recalibration, or at least verification of its previous calibration. The method for calibrating graduated cylinders depends on the type of cylinder. Graduated cylinders are marked either TC, meaning “to contain,” or TD, meaning “to deliver.” For a TC cylinder, the volume readings marked on its side represent the amount of liquid contained in the cylinder. This amount will differ from the volume actually delivered by the cylinder when the liquid is transferred to another container. A few drops of liquid will usually remain in the cylinder, and this volume of liquid has been taken into account for a cylinder that has been calibrated TD. The calibration method is based on measuring volumes of water and then determining the mass of the water that was measured. Water exhibits a density of 1.00 grams per milliliter (g/mL) near room temperature. This means that each 1.00 mL of water should weigh 1.00 g. Thus, a cylinder containing 5.0 mL of water should contain 5.0 g of water. Tare the balance so that it reads exactly zero, then place the graduated cylinder on the balance and record (write down) its mass. Fill the graduated cylinder to 20 or 25 percent of its capacity with distilled water. The liquid in the cylinder will for a U-shape called a meniscus. The proper volume reading is taken at the bottom of the U. Add the last few drops of water one drop at a time from an eyedropper to bring the meniscus to exactly the desired mark. Record this volume reading. Return the cylinder to the balance and record the new mass of the cylinder. Repeats Steps 2 and 3 for volumes of 50, 75 and 100 percent of the cylinder’s maximum volume. Subtract the mass of the empty graduated cylinder from each of the mass readings. This will give the mass of just the water in the cylinder. Use graph paper or a computer graphing program to plot the calibration data on x-y coordinates. Plot the mass readings on the y-axis and the volume readings on the x-axis. Include the origin (0,0) as a data point. Draw a straight line through the data points. Refer to the graph when using the graduated cylinder in the future. Find the volume reading on the cylinder on the x-axis, then locate the corresponding y-value of the line for that value of x. The y-value indicates the “true” volume in the cylinder. Remember that this calibration is valid only for determining how much water the cylinder actually contains, not how much it will deliver to another container. Tare the balance so that it reads exactly zero, then place an empty beaker or plastic cup with a volume at least as large as that of the cylinder on the balance and record (write down) its mass. Fill the graduated cylinder to 25 percent of its capacity with distilled water. The liquid in the cylinder will for a U-shape called a meniscus. The proper volume reading is taken at the bottom of the U. Add the last few drops of water one drop at a time from an eyedropper to bring the meniscus exactly to the desired volume mark. Record this volume reading. Pour the water in the cylinder into the empty beaker, then return the beaker to the balance and record its new mass. After the beaker has been weight, empty its contents and dry it before proceeding to Step 4. Whenever using the cylinder in the future, refer to the graph. Find the volume reading on the cylinder on the x-axis, then locate the y-value of the line for that value of x. The y-value indicates the “true” delivery volume of the cylinder. Remember that this calibration is only valid for the amount of liquid the cylinder will actually deliver, not for how much the cylinder contains. 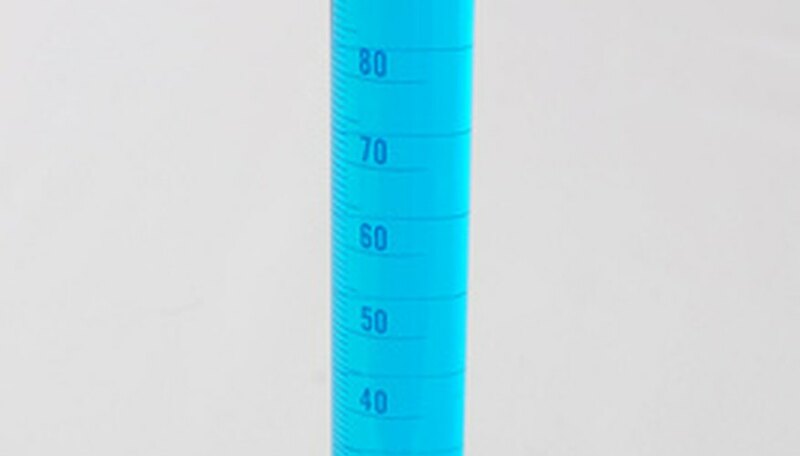 When filling a graduated cylinder, always lift the cylinder to eye level to read its volume. Never lower your head to table level; if the cylinder spills or breaks, your eyes and face will be vulnerable to splashes and flying glass. The use of safety glasses is recommended. Brubaker, Jack. "How to Calibrate a Graduated Cylinder." Sciencing, https://sciencing.com/calibrate-graduated-cylinder-6337018.html. 24 April 2017.